NEW BRITAIN - The city is on its way to having some new officers on the police force. Seven New Britain police cadets graduated from the New Britain Police Academy on Friday. 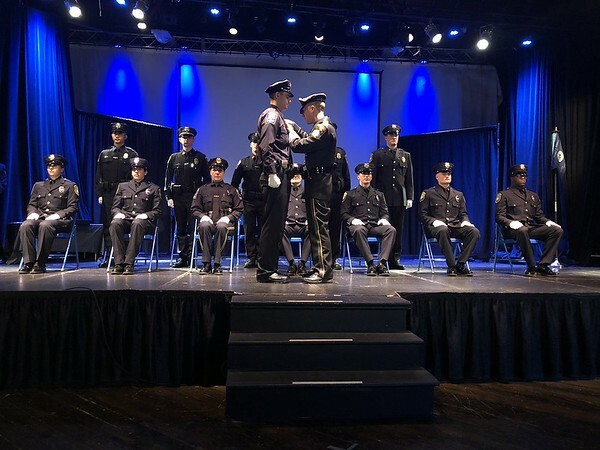 The seven are among a group of 13 cadets from New Britain and other departments in the state that include Avon, Bristol, Newington and West Hartford who graduated. “We’re very proud of them and looking forward to them applying what they learned in a safe environment,” said New Britain Police Chief Chris Chute. The six months of training involves teaching the cadets constitutional law, search and seizure procedures, de-escalation techniques, and officer wellness. Training days are long and start at 5:45 a.m. and last until 4:30 p.m., Chute said. The days begin with physical training that includes cross training and high-intensity running, in order to make sure the officers are in shape and are taught how to care for their overall health and wellness, Chute said. “Having graduated, the cadets are now on a probationary period that will consist of about three months of field training in each of their respective departments, Chute said. The probationary officers will be partnered with field training officers, who have at least three years of police experience, Chute said. The new officers will work toward handling work on their own by the end of the three months. The training is broken up into four phases, in which the probationary officer handles 25 percent in the first phase, 50 percent in the second phase, 75 percent in the third phase and 100 percent, under the direct supervision of the field training officer, in the final phase. The field training officers will rotate with each new phase so that the probationary officers can learn different styles of the job, Chute said. The probationary officers will also work different shifts. The goal is to try and give the new officers as much patrol time as possible, Chute said. About 95 percent of the training academy classes take place in New Britain. Cadets use the shooting range at the Glastonbury Police Department and complete other smaller tasks, like swimming and defensive driving, in the Central Connecticut area, Chute said.